TraumaCad enables surgeons to accurately template patient images, take measurements, and simulate the expected result prior to surgery. For over a decade, TraumaCad has set the standard in orthopedic digital templating. INTERESTED TO KNOW WHAT’S COMING NEXT? TraumaCad offers different business modules tailored to your needs. All editions include automatically updated templates library, PACS integration, automatic calibration and image detection, and automatic software upgrades. Impress your attending. Template digitally. templating free of charge to qualifying residents. 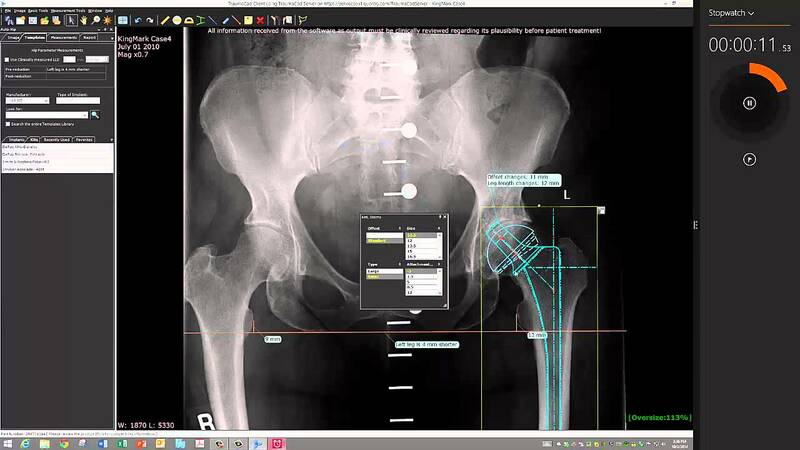 TraumaCad automatically detects the anatomical regions in x-ray images, thus saving surgeons valuable time when planning common procedures, including: relevant measurements, implant position and sizing, and simulation of post-operative results. The unique TraumaCad algorithm automatically detects calibration devices such as KingMark, VoyantMark and standard ball markers. The application determines the magnification percentage of the image, thus allowing precise measurement and appropriate template selection. With a single click, the Auto-Hip functionality automatically positions your preferred cup and stem, performs a virtual resection, and calculates the resulting leg length and offset. 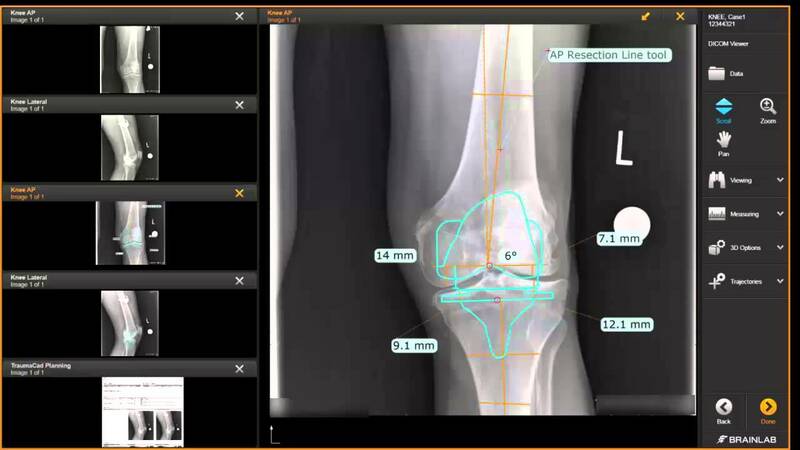 Auto-Knee automatically positions resection lines to the AP view, determines implant sizing and position for both AP and LAT images, and visualizes the expected knee alignment on the AP view. 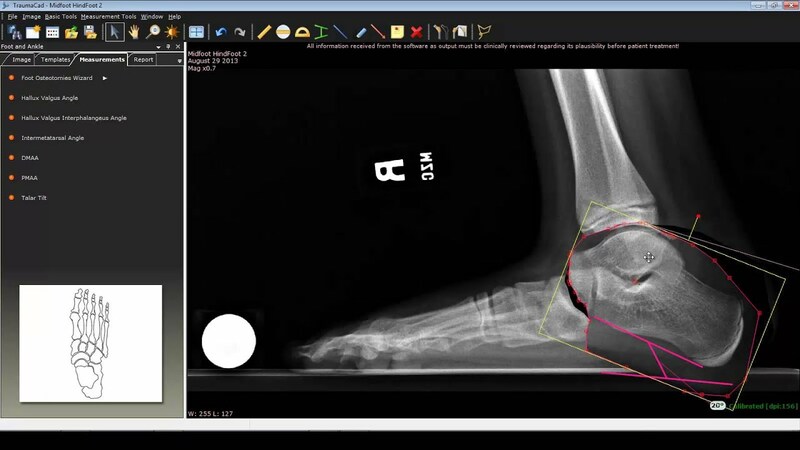 Ease of use in comprehensive deformity corrections allows you to automatically visualize osteotomy results and limb alignment following CORA planning. TraumaCad automatically pushes new software releases & templates library updates to internet connected clients, providing you with quick and easy access to our latest updates. TraumaCad is designed to provide a flexible PACS workflow that suits the enterprise or small private practice. 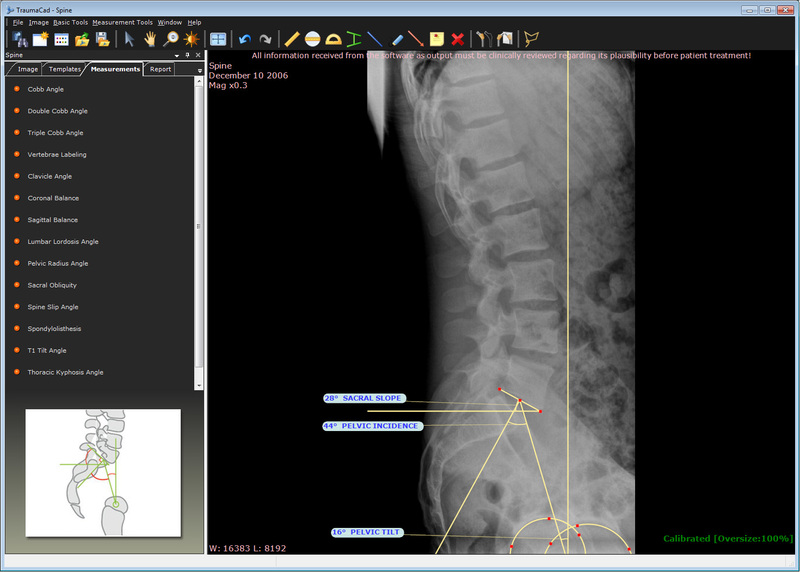 Supporting the DICOM standard, TraumaCad can be integrated in the PACS viewer or launched independently. Planned cases can be saved back to PACS as well as to local storage, or Quentry cloud services. This short and intuitive workflow can save you valuable planning time and improve intraoperative workflows. TraumaCad offers an up-to-date templates library with over 3,000 implant families. The library is automatically updated, ensuring you always have access to the most updated templates. Customers' requests for new templates are free as part of TraumaCad templates subscription and handled with high importance. REQUEST A TEMPLATE Can't find the template you’re looking for? Moving forward with the latest technologies, TraumaCad is also available in a cutting edge mobile version, as an iPad® app, or via web browser on your PC or Mac®. 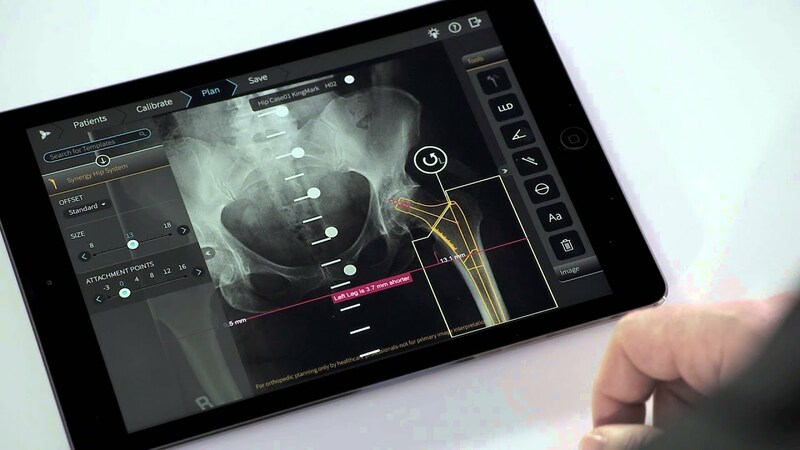 TraumaCad Mobile will allow you to plan Total Joint Replacement quickly and easily, using only a few gestures. 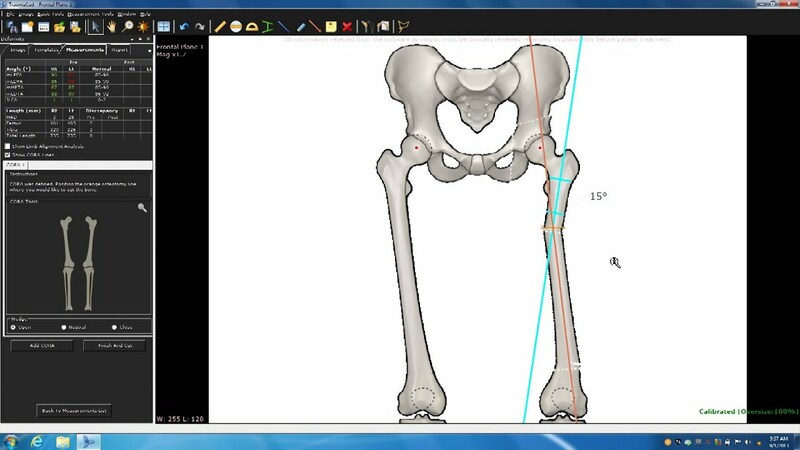 The Auto Hip and Knee functionalities simplify the workflow and can save valuable time. We invite you to take your planning experience one step further with TraumaCad Mobile, sign up for a free trial today! 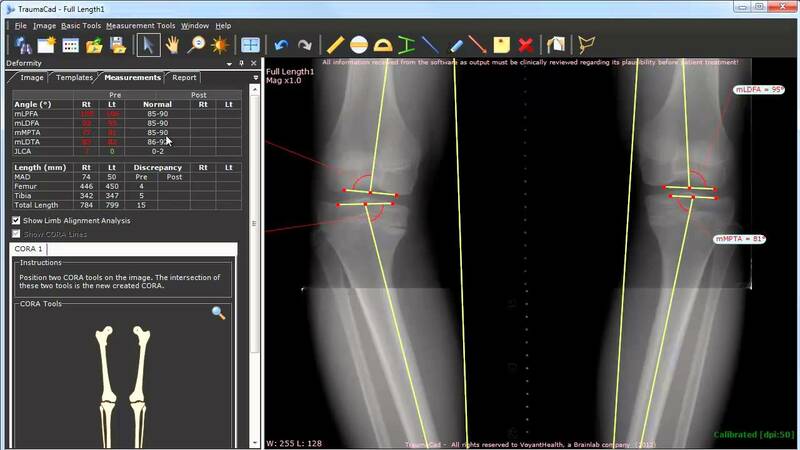 TraumaCad is the leading software planning solution for joint reconstruction. It provides you with intuitive tools to digitally template and plan surgery as well as evaluate post-operative outcomes. With a single click, the Auto-Hip functionality automatically positions your preferred cup and stem, performs a virtual resection and calculates the resulting leg length and offset. "TraumaCad will allow busy orthopedic surgeons to much more precisely plan for joint-replacement surgery." 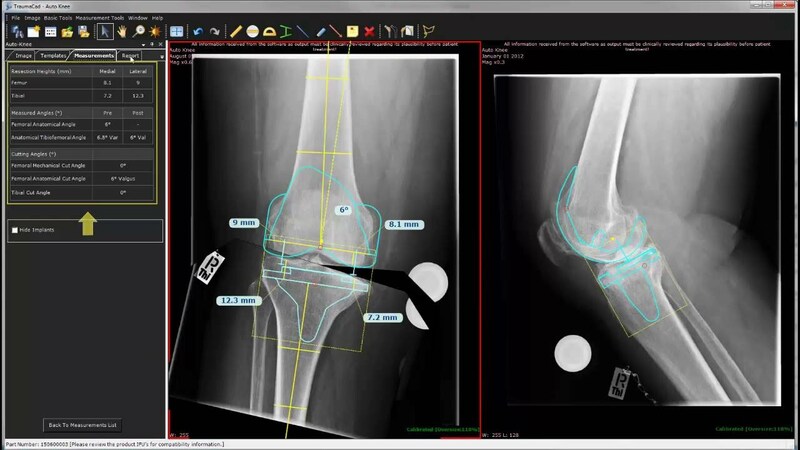 Our latest release features an automatic Knee planning functionality, providing you with a quick method to perform TKR planning. This feature automatically detects the anatomical regions in the image, positions resection lines to the AP view, and determines the template position and sizing for both AP and LAT images. Finally, it allows you to automatically create fragments to visualize the expected knee alignment on the AP view. TraumaCad offers a complete database of shoulder, elbow, wrist, and finger prosthesis to plan various upper limb procedures, including standard and reverse shoulder replacement. 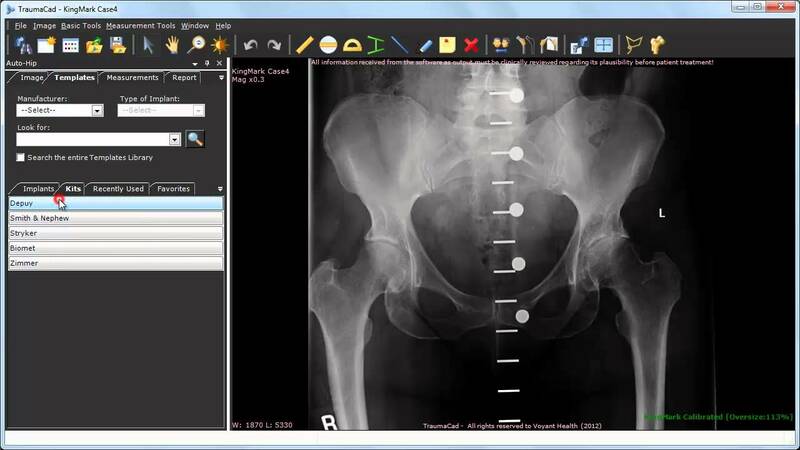 Pre-define surgical kits with your favorite implants, and place them on the image with a single click. 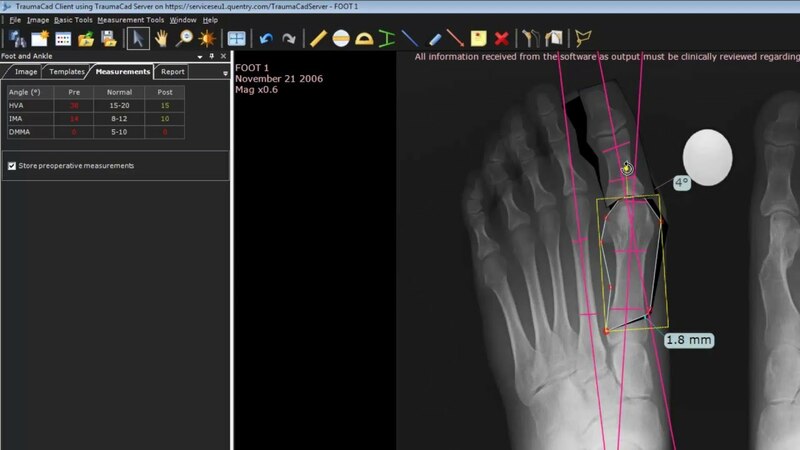 TraumaCad offers a variety of intuitive and easy to use wizards and measurement tools specifically designed for Foot & Ankle pre-operative planning. 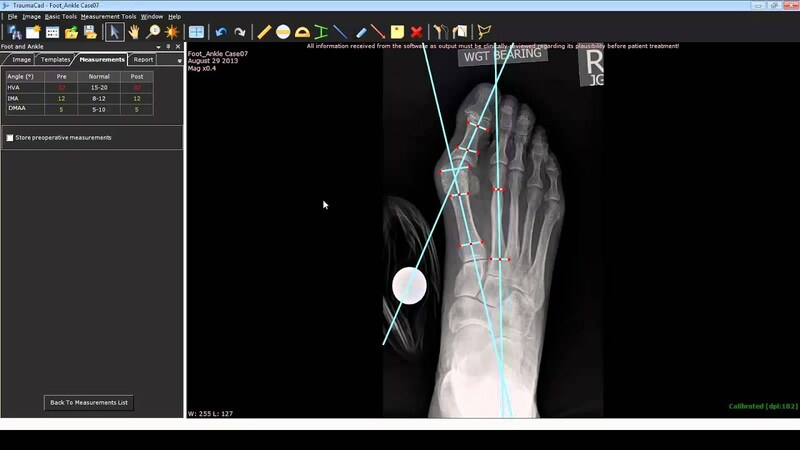 The Foot Osteotomies Wizard allows you to perform a complete unilateral or bilateral Hallux valgus (bunion) assessment, compare the measurements to the normative standards, and to simulate the corrective osteotomy. A variety of common measurement tools are available for use, including Hallux Valgus Angle, Intermetatarsal Angle, Distal and Proximal Metatarsal Articular Angle and Talar Tilt. Visit our Education Center to learn more about TraumaCad various Foot & Ankle tools. 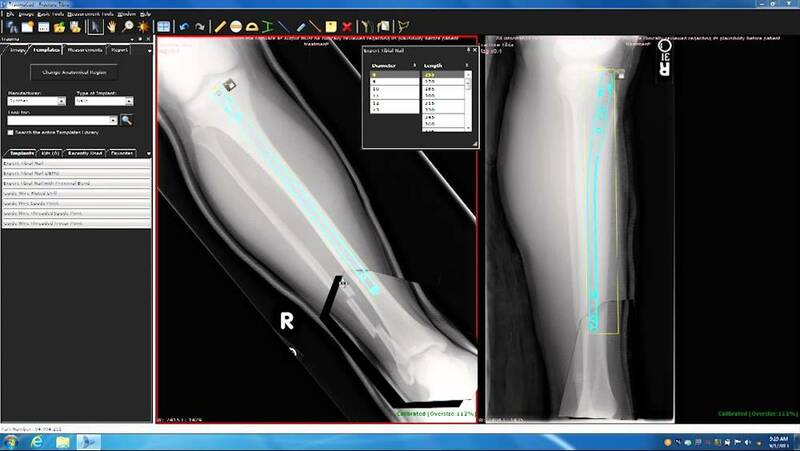 TraumaCad was specially designed by pediatric orthopedic surgeons to provide doctors with intuitive tools to digitally template and plan surgery. The variety of wizards and measurements ranges from simple tools to comprehensive assessments, including limb alignment analysis and deformity corrections. TraumaCad sets the standard for pediatric and deformity planning, employing basic and advanced limb reconstruction concepts, including: corrective osteotomies, limb alignment, limb lengthening and internal & external fixation principles. Deformity analysis and correction planning. 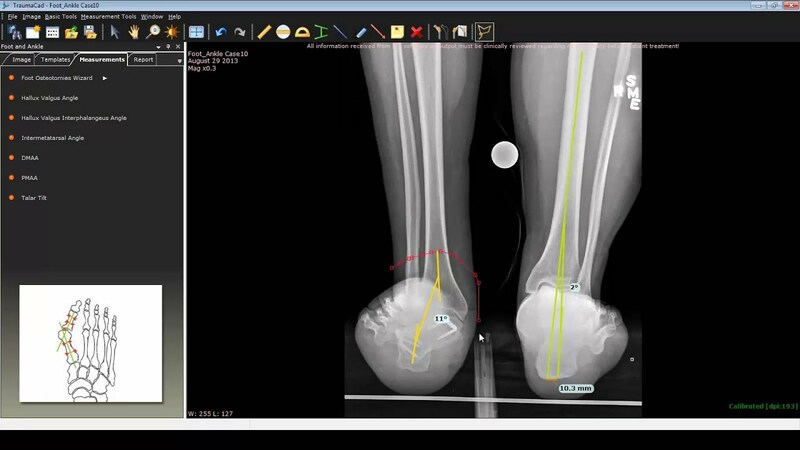 Measure multiple CORAs to automatically segment and align limb deformity. Taylor Spatial Frame treatment. Determine and visualize corrective procedures. Generate report file to be uploaded to SpatialFrame.com for a prescription. 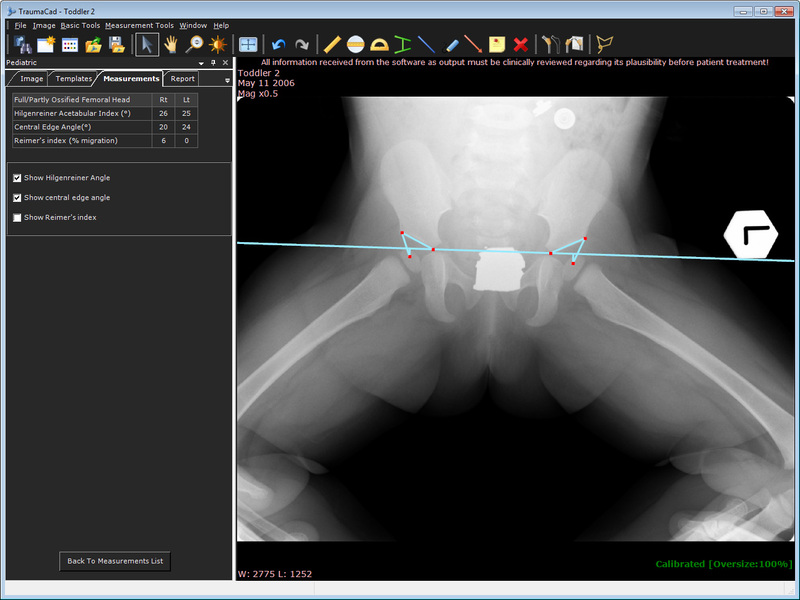 "TraumaCad is a very sophisticated software system which makes my life as a deformity surgeon so much easier. It is easy to use and has a modern clear interface. For planning and templating in orthopaedics, there really is no point looking elsewhere." Fracture planning is an important step in the operative management of any trauma treatment. 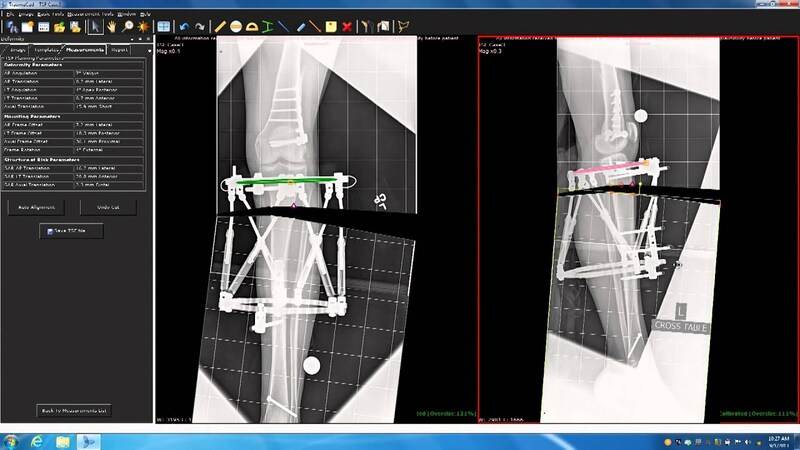 TraumaCad's measurement tools and reduction tool provide a collection of pre-operative digital planning techniques for evaluating fractured anatomy and selecting the method of fixation. TraumaCad's spine specific measurement tools and wizards support a robust collection of comprehensive measurement techniques for evaluating patients’ spine anatomy, implant sizes, osteotomies, and fragments. 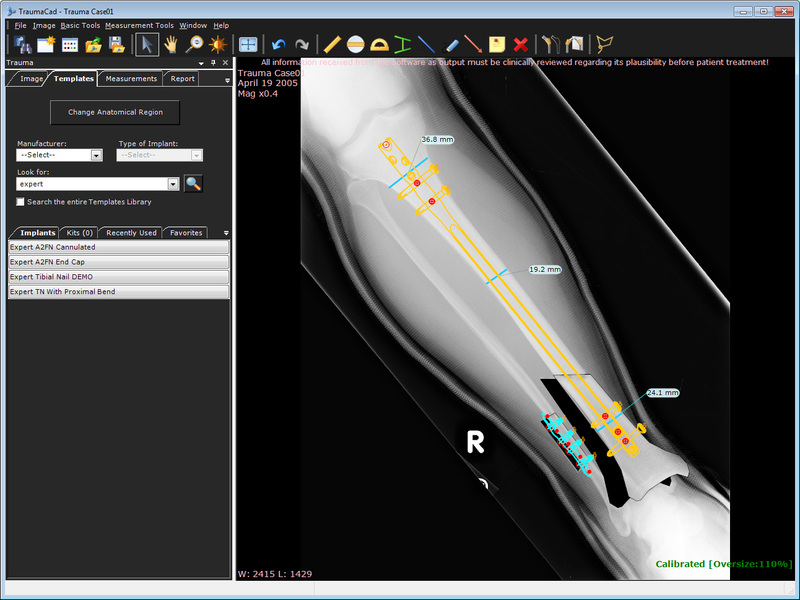 Outcome based planning features allow you to simulate osteotomies, manipulate fragments, and determine implant sizes. Preoperative planning of total hip replacement using the TraumaCad system. Radiographic Templating of Total Hip Arthroplasty for Femoral Neck Fractures. Comparison of Hallux Valgus Deformity Evaluation on Printed Versus Digital X-Rays. 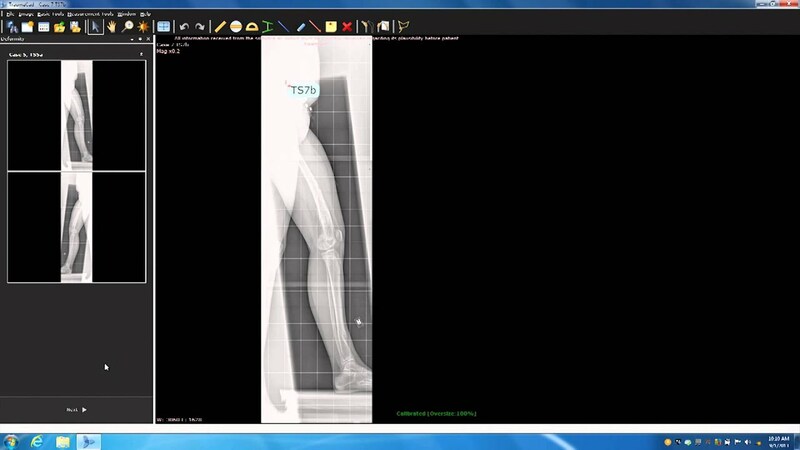 Radiographic Assessment of Lower Limb Lengthening in Achondroplastic Patients, Using the Ilizarov Frame A 5-19 Year Follow up Study. 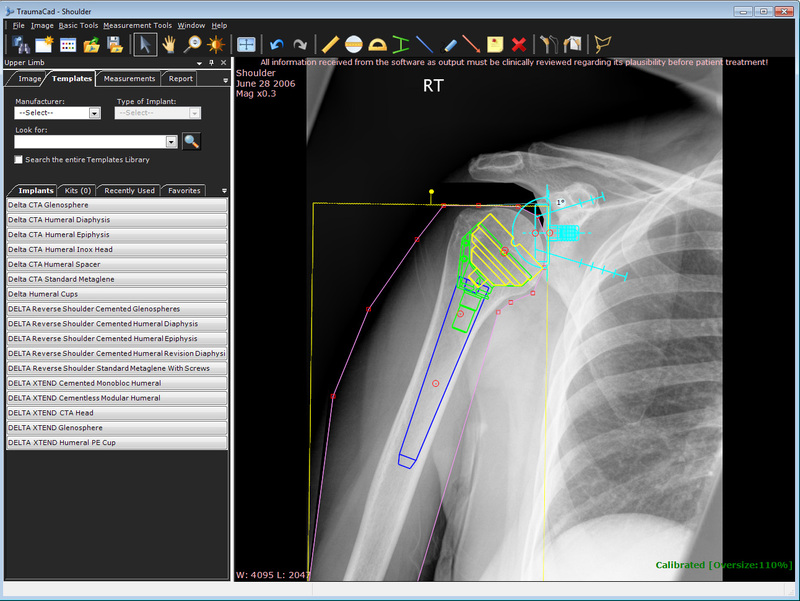 Pre-operative Planning Using the TraumaCad Software System. The Accuracy of Digital Templating in Primary Total Hip Arthroplasty. 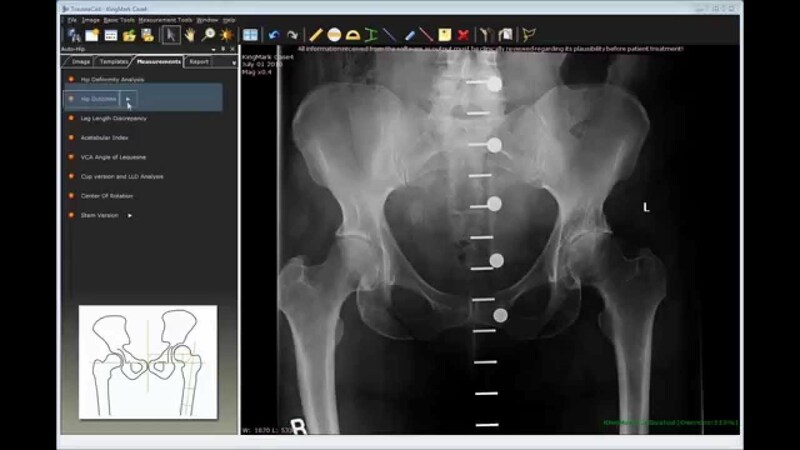 Accuracy of Digital (Filmless) Templating in Total Hip Replacement. The Accuracy of Automatic Calibration of Digital Pelvic Radiographs Using Two Different Scale Markers: A Comparative Study. 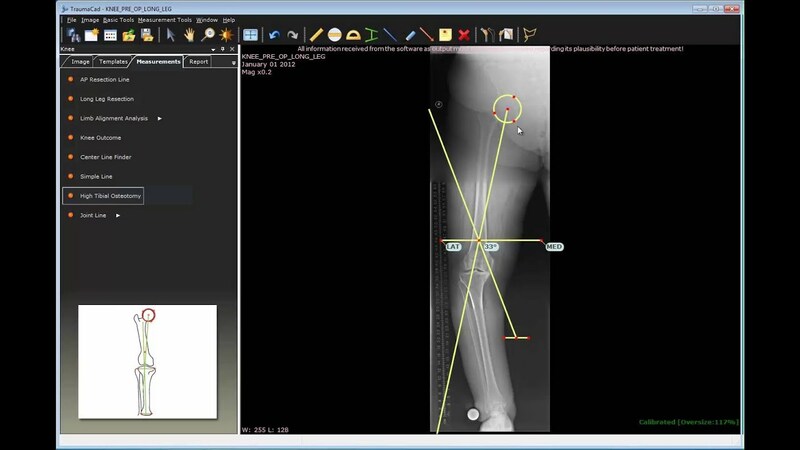 Intra- and Interobserver Reliability Analysis of Digital Radiographic Measurements for Pediatric Orthopedic Parameters Using a Novel PACS Integrated Computer Software program. "We have used TraumaCad for several years and find it an extremely useful tool both for pre-operative planning and training. As far as hip arthroplasty is concerned, our trainees are not allowed to undertake a procedure until they have planned it using TraumaCad. The software is user friendly, intuitive and produces a report which is an important part of the patient record. In revision surgery, pre-operative planning is further enhanced by the opportunity to plan using TraumaCad." "TraumaCad Digital Templating has changed our workﬂow very positively. In our increasingly busy healthcare environment, TraumaCad allows images to be sent to us directly, rather than having to go to the surgeon's office during clinic hours to template (for surgeons who count on reps to template). With TraumaCad, cases can be templated, conveniently... even after hours! TraumaCad saves us time, it's accurate, and it is a professional, value-added service. Surgeons appreciate the accuracy of TraumaCad and seem to like the notations ﬁeld which can be seen on the bottom of the images." “TraumaCad is an excellent tool to supplement case preparation. I ﬁnd it especially useful for templating challenging cases to confirm appropriate femoral head size prior to scheduling. The ability to access, and template, the images from anywhere is a great concept. Everybody seems to appreciate the simplicity of the process. Imaging staff have commended the ease of installation/upload, and my surgeons value being able to walk into cases with enhanced information. The accuracy and consistency in measurement far surpasses my results when utilizing standard acetate templates." "TraumaCad is an excellent planning software program. The patients and their families love seeing the before and after reports. TraumaCad is a teaching tool. Preoperative planning is paramount for resident education and surgeon preparation. It is an excellent way to work through the surgery to produce the best outcome for the patient." "We have had TraumaCad for a few years now and it has been outstanding. I remember being very impressed when the software was initially presented to us. It has more than lived up to my expectations! Firstly it is very easy to use and intuitive. It is highly accurate when used in combination with the KingMark calibration or other known marker. I have been able to template a wide array of implants when considering different options during pre-op planning. All my colleagues have been extremely happy with it and I can honestly say I have not heard of any issues with its use. I would definitely recommend TraumaCad software to any hospital updating its templating capabilities." "I have been an early adopter of TraumaCad and this was driven by necessity. Firstly, I live and work in a fairly remote area so I have to have the confidence that before I committed my patients to surgery I had the correct sized components on the shelf. Secondly, as you are aware we have multiple trays of instruments for joint replacement surgery and if I can accurately determine the component size then I only open the specific jigs for that patient and this significantly reduces the inventory for surgery. I have reached the stage where I now feel insecure if I don't have this kind of information pre operatively. We also have good radiographers who take good x-Ray's with the relevant markers. The whole process has now become easy and routine." "We use TraumaCad for all major reconstructive cases. The support from the TraumaCad team has been extremely valuable using the reverse planning method in digital planning. Additionally, the TraumaCad team has made a great effort providing educational activities in digital planning for young Trauma surgeons in Denmark." "The richness of TraumaCad’s template library, enabled the software’s rapid adoption by the entire surgical team, who quickly abandoned any other planning method. The ease of use of this software and its predictive reliability have resulted in a dramatic simplification of the planning workflow. This progress is now much appreciated by all stakeholders of the Arago Clinique, including radiologists, surgeons and operating theater staff." "TraumaCad helps me to complete an important step in my preoperative planning and provides me with a time stamped, digital record for future review." 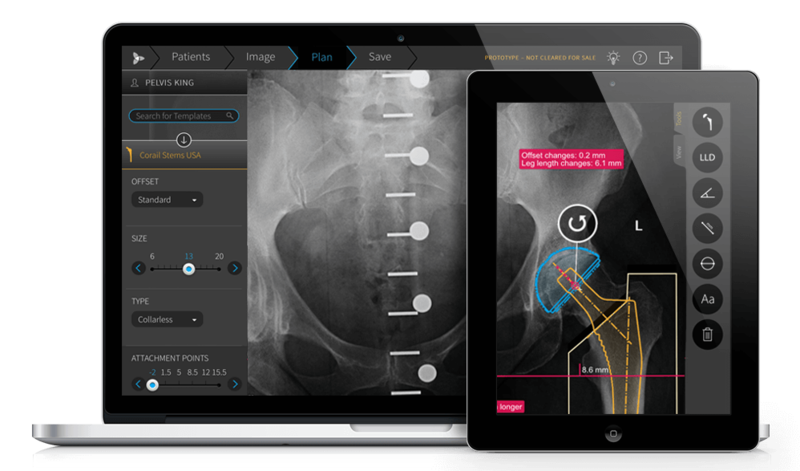 "I have been using TraumaCad since 2005 and I can easily say that it is an essential tool for every orthopaedic surgeon/department. It caters to trauma planning, joint arthroplasty and deformity planning. It even has clever tools for paediatric orthopods. I have seen other products in the market before buying it for our institute and I found no other planning software as comprehensive as TraumaCad." "We have been working with TraumaCad for three years and we have to say it has always been an effective customer/provider partnership. Engineers and technicians are prompt in their replies, available for their customers and technically efficient. We can trust them. And it is a critical point, especially in a medical environment where patients are the critical elements of this partnership. That is what makes them one of our best providers. We strongly recommend TraumaCad, without any hesitation." "Yale-New Haven Hospital uses the TraumaCad application for orthopedic templating. It is essential that we have reliable product support for the application. TraumaCad’s support team is comprised of IT professionals who specialize in specific products. When I communicate with TraumaCad’s product support, my issues are resolved and questions answered in timely fashion. " "A workflow solution like this gives our orthopedic surgeons and fellows improved access to digital templating and enables us to spend more time with our patients, something we always strive to do." 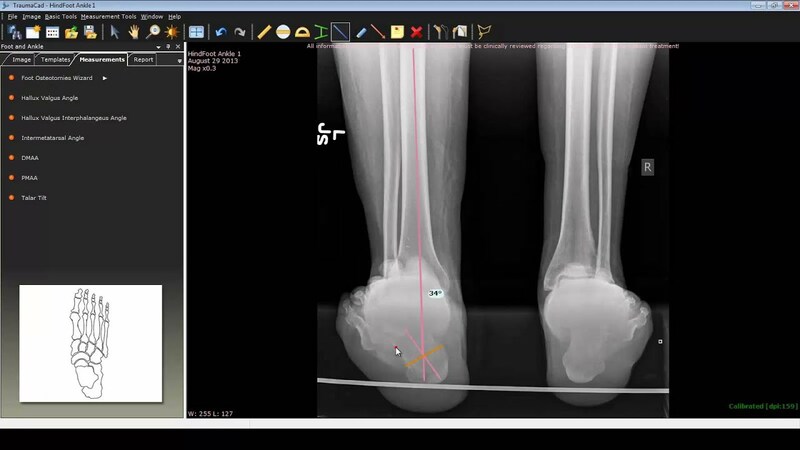 "Our orthopedic surgeons at UPMC Mercy can now digitally plan their surgeries at a time that is convenient to them, with complete access to all necessary x-rays and advanced planning tools. This allows the surgeon to more accurately predict the type and size of prosthetic implants, and is proving to be a clinical advantage." "OrthoCarolina has been in partnership with Brainlab since July 2007. During this time, their customer support and product development have been superior and sets the standard for other vendors to aspire to. Brainlab is a very integral component of OrthoCarolina’s ability to provide the highest level of orthopedic care to our patients. We look forward to continuing our partnership, upcoming innovations and outstanding customer support." Our global support team is standing by to address any question or comment you might have. To start a live chat session with Brainlab’s Global Support Center, please fill out the form below. The live chat is operated by Brainlab Ltd.
Sign up to get the latest TraumaCad updates. After submitting the form, a member of our team will contact you shortly. A member of our Global Support Center will be in touch with you shortly. We welcome you to try TraumaCad. After submitting the form, a member of our team will contact you shortly. The protection of your personal data is very important to us. At this point, we would like to inform you about data protection in our company. Your personal data will solely be used in accordance with statutory data protection regulations, such as the European Union General Data Protection Regulation (GDPR). Our employees and agents are obliged to comply with data protection regulations. Below you will find information about the nature, scope and purpose of the collection and use of your personal data and your rights. These notes can be accessed at any time on the internet at https://www.traumacad.com/#privacy. ◦	Google Tag Manager Google Tag Manager does not collect personal data. The Tag Manager makes it easier for us to integrate and manage our tags. Tags are small pieces of code that can be used, among other things, to measure traffic and visitor behavior, track the impact of online advertising and social channels, set up remarketing and audience targeting, and test and optimize websites. We use the Google Tag Manager for all services listed in section 2.1 below. If you’ve opted out, Google Tag Manager will consider that opt out. For more information about Google Tag Manager, see: https://www.google.com/analytics/tag-manager/use-policy/. ◦	Google Analytics This website uses Google Analytics, a web analytics service provided by Google LLC (1600 Amphitheater Parkway, Mountain View, California 94043, USA). The IP Anonymization feature in Google Analytics sets the last octet for IPv4 user IP addresses and for the last 80 bits in memory for IPv6 addresses to zero, just after being sent to the Analytics data collection network for collection. In this case, the full IP address will never be written to disk. Further information on anonymization can be found here: https://support.google.com/analytics/answer/2763052. ◦	Google Dynamic Remarketing On our website we use the dynamic remarketing feature of Google AdWords. The technology allows us to post automatically generated, targeted ads after you visit our website. The advertisements are based on the products and services you clicked on the last visit to our website. ◦	YouTube Our website contains links to various videos from YouTube (YouTube, LLC, 901 Cherry Ave, San Bruno, CA 94066, USA), a service provided by Google Inc. We have embedded YouTube videos via the “Privacy Enhanced Mode”. A connection to YouTube's servers is therefore only established if you actively click on a linked video. Google will than use your data for the purposes of advertising, market research and/or the customized design of its website. As long as you do not watch a video, there will be no data exchange with YouTube and Google. The duration of the used cookies is limited to max. 24 months, unless otherwise stated below. A cookie is a small text file that allows a website to recognize a browser. Cookies are stored in a text file on the computer and retrieved and read the next time the web server is contacted. As a user, you can use your browser settings to decide for yourself whether and which cookies you want to allow, block or delete. Alternatively, you can also use so-called adblockers, such as Ghostery. However, the collection and storage of data for the purpose of website optimization can also be objected to at any time with future effect via the following opt-out link http://www.youronlinechoices.com/uk/your-ad-choices. Use the link above to manage your preferences for usage-based online advertising. If you object to a usage-based online ad using the preference manager, it will only apply to the specific business data collection from the web browser you are using. The preference management is cookie-based. Deleting all browser cookies also removes the preferences you set with the preference manager. If you want to deactivate Google Analytics, you can alternatively also download a corresponding add-on for your web browser at: https://tools.google.com/dlpage/gaoptout. There is no legal or contractual obligation to provide personal data. The provision of personal data is also not required for the conclusion of a contract. Possible consequence of not providing personal data is the limited usability of the website. There is no automated decision-making including profiling according to Art. 22 GDPR. You have the opportunity to contact us for a free trial with TraumaCad via the Request a Free Trial Form. There is no legal or contractual obligation to provide personal data. Possible consequence of not providing personal data is that we cannot provide you with the requested free trial. You can contact us to make an appointment for a customer meeting at one of the public events worldwide using the Schedule a Meeting form. * Used for this purpose only if you have consented to it. In this case, we also record the consent you have given us. To prove that we obtained your consent, your consent will be stored for three years. This is based on our legitimate interest to prove that you have given your consent and that we have acted in compliance with the law (Art. 6 Para. 1 Sec 1 lit. f GDPR). There is no legal or contractual obligation to provide personal data. The provision of personal data is also not required for the conclusion of a contract. Possible consequence of not providing personal data is that we cannot schedule the requested meeting. There is no automated decision-making including profiling according to Art. 22 GDPR. You can subscribe to the latest TraumaCad updates via the SUBSCRIBE TO OUR NEWSLETTER form. Ser. No. Data	Purpose	Legal basis 1	Contact form data (first name, last name, company, address, e-mail address, phone)	Verification of customer contact, managing the newsletter subscriptions and sending out the product and services information*	Art. 6 para.1 lit. a GDPR (for Germany in conjunction with Sec. 7 para. 2 No. 2 and 3 Unfair Competition Act – UWG) Sec. 7 para. 3 Unfair Competition Act – UWG) * Used for this purpose only if you have consented to it. In this case, we also record the consent you have given us. To prove that we obtained your consent, your consent will be stored for three years. This is based on our legitimate interest to prove that you have given your consent and that we have acted in compliance with the law (Art. 6 Para. 1 Sec 1 lit. f GDPR). We also use the e-mail address collected in connection with the sale of a product or service on our website for the direct marketing of own and similar products and / or services. If you do not wish to receive advertising, you may object to the use of your email address at any time without incurring any costs other than the basic rate for communication means. For this purpose, there is a corresponding link to unsubscribe in each newsletter. There is no legal or contractual obligation to provide personal data. The provision of personal data is also not required for the conclusion of a contract. Possible consequence of not providing personal data is that we cannot provide the requested information. You can contact our support team for any kind of request via the CONTACT SUPPORT form. There is no legal or contractual obligation to provide personal data. The provision of personal data is also not required for the conclusion of a contract. Possible consequence of not providing personal data is that we cannot provide the requested support. You can start a live chat session with our global support center via the Star Live Chat Session form. There is no legal or contractual obligation to provide personal data. The provision of personal data is also not required for the conclusion of a contract. Possible consequence of not providing personal data is that we cannot arrange a live chat session. You can submit a request for a template that you do not find in TraumaCad software through Request A Template form. There is no legal or contractual obligation to provide personal data. The provision of personal data is also not required for the conclusion of a contract. Possible consequence of not providing personal data is that we cannot process your template request. You can submit a request to join TraumaCad Web residents program by completing the TraumaCad Web residents program application form. There is no legal or contractual obligation to provide personal data. The provision of personal data is also not required for the conclusion of a contract. Possible consequence of not providing personal data is that we cannot process your application. At the request of the competent authorities, we must provide information on personal data (inventory data) on a case-by-case basis for the purpose of law enforcement, security, compliance with the statutory functions of the constitutional protection agencies or the Military Shielding Service or for the enforcement of intellectual property rights. For anonymised data for Google Analytics und for Conversion Tracking, see above. Google is subject to the EU-U.S. Privacy Shield. Existing EU-U.S. Privacy Shield certifications can be viewed at https://www.privacyshield.gov/list. The Implementing Decision (EU) 2016/1250 of the EU Commission of 12 July 2016 recognizes the level of protection of the EU US Privacy Shields as equivalent to the level of protection of the Union. Facebook is subject to the EU-U.S. Privacy Shield. Existing EU-U.S. Privacy Shield certifications can be viewed at https://www.privacyshield.gov/list. The Implementing Decision (EU) 2016/1250 of the EU Commission of 12 July 2016 recognizes the level of protection of the EU US Privacy Shields as equivalent to the level of protection of the Union. In some cases, we also use service providers for hardware maintenance, software maintenance and provision of technical services, which may then come into contact with your data. ◦	it is permitted by law and is required for the execution of contractual relationships with you. Further information on the recognition of safe third countries can be found on the website of the EU-Commission. Present EU-U.S. Privacy Shield Certifications can be viewed at https://www.privacyshield.gov/list. The Implementing Decision (EU) 2016/1250 of the EU Commission of 12 July 2016 recognizes the level of protection of the EU-US Privacy Shield as equivalent to the Union’s level of protection. We will provide you with a copy of the EU standard contract clauses upon request. We process and store your personal data in as far as necessary for the duration of our business relationship, which includes, for example, the initiation and execution of a contract and the regular limitation period of three years to defend against or assert legal claims. In addition, we are subject to various storage and documentation obligations arising, inter alia, from the German Commercial Code (HGB) or the Tax Code (AO). The retention periods specified therein are six to ten years. During this time, the processing of the data is limited. The retention obligation begins at the end of the calendar year in which the offer was made or the contract was fulfilled. For example, commercial or tax-relevant accounting documents are kept for ten years and contract and tax-relevant documents for at least six years. In legal matters supervised by lawyers, the related data are stored for at least six years; for enforcement titles, the retention period can be up to thirty years due to the statute of limitations. IP addresses are usually temporarily stored for connection, if we also use them for website optimization or for advertising purposes, they are immediately anonymized and processed only anonymously. The duration of used cookies is limited to 14 months. ◦	pursuant to Art. 77 GDPR lodge a complaint with a supervisory authority. For asserting the statutory data subject rights and for all other questions about data processing, please write to the address of Brainlab Ltd. listed in the Corporate Information link on the website or send an e-mail to legal@brainlab.com. The exercise of your above rights is free of charge for you. For US Residents: You authorize Brainlab to communicate with you in response to your submissions on the website and any other communications. Notice to California Residents: The California Civil Code permits California residents to request that we not share your Personally Identifiable Information with third parties for their direct marketing purposes. If you are a California resident, you may contact legal@brainlab.comto request information regarding whether and how we share personally information with third parties for their direct marketing purposes and/or to request that such information not be shared with third parties for such purposes. For inquiries, please contact legal@brainlab.com. “Non-Personally Identifiable Information” refers to data stored anonymously in a protocol file, collected by cookies or similar technology, as well as information collected by Google Analytics, AdWords and Brainlab’s display networks, and any other information that does not personally identify the individual to whom the information relates, such as information that is aggregated by Brainlab or a third party, or information that is not linked to personally identifiable information of an individual. In addition to the uses discussed above, Brainlab may use and share non-Personally Identifiable Information in a variety of ways so long as Brainlab uses such information in its de-identified form. These uses may include, without limitation, uses for website administration; analysis of website trends and how the site is used; improving navigation of the site; analysis of the performance of the website and diagnosis of problems; improving the services we offer; analysis and developing advertisements and advertising campaigns; analysis of website user demographics, interests and preferences. Brainlab also may use your non-Personally Identifiable Information to present you with targeted content and advertisements (including on third party websites and apps) based on your past visits to the website and your non-Personally Identifiable Information collected over time by us and third parties, optimize and determine the effectiveness of content and advertisements, analyse your interactions with content and advertisements, and how those interactions relate to your visits to the website. Some of our third party partners may participate in the Digital Advertising Alliance’s Self-Regulatory Program for Online Behavioural Advertising and allow consumers the ability to opt-out of targeted advertising based on web activity tracking. For more information regarding the foregoing, please Click here or visit http://www.aboutads.info/choices/. Please note that even if our third party partners participate in this program and you opt-out of targeted advertising based on web activity tracking, you still may receive standard advertisements from us and targeted advertisements from third parties. You may need to re-click the link and follow the instructions provided therein if you delete cookies or similar technology or use a different computer, device or browser. Brainlab will not knowingly collect, use or disclose any information submitted by children under the age of majority in the jurisdiction where they reside. Parents are encouraged to educate their children about their use of the Internet, and particularly about security issues regarding the disclosure of personally identifiable information to websites. You may have the opportunity to follow links on the website to other sites that may be of interest to you. Neither Brainlab nor its affiliates are responsible for the privacy practices of any other sites or the content provided thereon. Therefore, the privacy policies with respect to other sites may differ from those applicable to the website. We encourage you to review the privacy policies of each other site. Brainlab is not a healthcare institution or medical facility and neither Brainlab nor the website provides any medical advice. You are solely responsible for all medical decisions, including any diagnosis, use of medical professionals, treatment or treatment plan, made by you as the result of the use of the website or any communications with Brainlab, regardless of any referral or suggestion made by Brainlab.